The project took 14 years. Under several presidents and VA secretaries, costs ballooned from $328 million to $1.73 billion as of its opening. AURORA, Colorado — It's gleaming, state-of-the-art and highly anticipated. But the Department of Veterans Affairs' newest medical center is also more than $1 billon over budget. 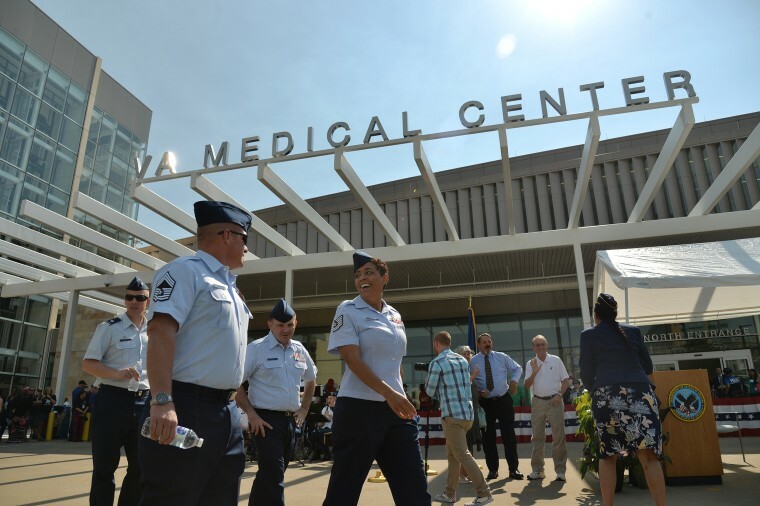 After more than a decade of delays and cost overruns, the VA officially opened its most expensive medical center ever earlier this month, hoping to turn the page on its troubled history. The Rocky Mountain Regional VA Medical Center in this suburb east of Denver is a sprawling complex of 12 buildings across 31 acres, on the site of the former Fitzsimons Army Base and Medical Center. A replacement for the VA's existing Denver medical center, the project took at least 14 years. Under several presidential administrations and VA secretaries, costs ballooned from an initially estimated $328 million to a contractually obligated $1.73 billion as of its opening. Planned opening dates slid repeatedly, from 2013 to this month. As of 2015, with the new center only half-built, Congress transferred management of the project from the VA to the U.S. Army Corps of Engineers to speed up its completion. Government reviews, congressional oversight and media reports have found VA mismanagement to be a root cause of the project's problems. VA senior officials testifying before Congress acknowledged the problems, but neither the VA nor the rest of the federal government has held any individuals accountable, even as some left the VA after receiving bonuses. At the official ribbon-cutting in July, speakers celebrated. "This is a great day," the VA's then-Acting Secretary Peter O'Rourke told the assembled crowd of public officials, veterans, their families and members of Congress, "for the VA, for Denver and for Colorado." "After years of unfulfilled promises, plans, false starts, well-documented problems and issues, changes in VA leadership, changes in Congressional delegation, yes, we have survived it," said Ralph Bozella, president of the United Veterans Committee of Colorado. "This wonderful thing is built." Before it opened, Sallie Houser-Hanfelder, director of the VA Eastern Colorado Health Care System, gave NBC News a tour. She showed off the long enclosed central concourse with soaring ceilings that connects all the buildings, the center's gleaming operating rooms, and its patient rooms, all single and private, with windows and pull-out beds that allow family members to sleep over. And a significant new addition: a spinal cord injury center, which will open in about six months. That impressed local veteran David Ortiz, who joined the tour at NBC News' request. A former Army helicopter pilot, Ortiz was paralyzed from the waist down after his helicopter crashed in Afghanistan in 2012. He marveled at its sliding doors and bathrooms, specially configured to the needs of paralyzed veterans. "To be honest, I was pretty blown away," he said. The medical center also has a wheelchair-accessible outdoor courtyard and a therapeutic pool. Ortiz recalled his impressions of a VA spinal cord unit in another city where he received treatment. "I remember thinking, we deserve better than this as veterans," he said. "And my impression today is, this is the facility we deserve." Allan Stone, a former commander with the Veterans of Foreign Wars (VFW) in Colorado, said local veterans have been waiting for years for the much-needed replacement of the old, now-inadequate medical center. "Veterans in this area have gotten very frustrated with it," he said, "because it could've been done many, many years ago." Though it's double the size of its predecessor, the new medical center has less of some resources. For example, fewer primary care teams, 12 versus 19. It was also supposed to have a facility treating combat veterans with post-traumatic stress disorder, or PTSD, but that remains unbuilt. So the VA is keeping parts of the old medical center, which has a PTSD center, open too — until it can build one at the new medical center, with more funding as a separate construction project. According to an estimate prepared for Congress, keeping the old medical center open could require another $350 million in maintenance and upkeep costs, if it stays open through 2023. "We estimate we'll have that unit over here way before then," Houser-Hanfelder said. The VA later told NBC News in an email that the VA "anticipates" the new PTSD facility to be completed approximately a year-and-a-half after that contract is awarded, and that it will cost less than $1.8 million annually to operate the Denver VA Medical Center in the meantime. A report by the Government Accountability Office in 2013 concluded "weaknesses in VA's construction management processes…contributed to cost increases and schedule delays." A report by the VA's inspector general in September 2016 found "escalating costs and schedule slippages are primarily the result of poor business decisions, inexperience with the type of contract used, and mismanagement by VA senior leaders." VA officials, it said, "did not properly oversee" the team of architectural and design firms. A decision by judges for the U.S. Civilian Board of Contract Appeals in 2014 found that the VA "materially breached" its contract with its primary construction company, Kiewit-Turner, "by failing to provide a design that could be built" for the estimated construction cost. It said the VA "drove up the costs of construction…by failing to control the [outside architectural and design firms]…[and] presenting [the construction contractor, KT] with a design which was allegedly complete but required an enormous number of modifications." The CBCA judges' decision said that the VA "never came close to providing a design that could be constructed" for the estimated and budgeted amounts. The judges' decision noted that an outside architect acting as mediator observed that the VA's construction management team was "the least effective and most dysfunctional staff on any project he had ever seen." Judi Guy was the coordinator of the project in Denver for 12 years, in charge of a team she says was responsible for helping the architects design and equip the medical parts of the hospital. Now retired, she spoke publicly for the first time, to NBC News. "It broke my heart. I feel so bad for the veterans," she said, tearing up, her voice catching. "I used to tell leadership, 'My dog is treated in a better environment than this [the previous VA medical center in Denver].' And all I wanted was for them to get a good hospital." "You know, it's like, follow the money," she said. "The money broke this project. And people who were trying to avoid blame broke this project. Everybody wanted to say, 'It's the architect. It's this firm. It's that firm. It's the VA hospital.' [But] it was the VA."
Guy specifically blames VA construction officials in Washington. "The crew in Washington that was responsible for this project is responsible for the major mistakes that were made," she said. She said cost information was kept from her and her team. "When they did cost estimates, we had no idea. We were kept out of all that," she said. Stone, the former VFW commander, who said he had owned his own construction company for 35 years, said it was obvious that the many changes to the construction plans drove up the costs. "I don't think there was [any accountability]," he said. "Who'd they answer to?" Asked about the history of problems, director Sallie Houser-Hanfelder directed questions to VA officials in Washington. But the VA in Washington declined to make any officials there available for interviews, including the one currently in charge of construction, Stella Fiotes, executive director for the VA's Office of Construction and Facilities Management, or CFM. Instead, the VA provided a statement: "No one is defending the problems with this project that occurred over many years under multiple administrations. VA has taken responsibility for those, learned from them and retooled its construction operations in response." At the ribbon cutting, before himself wielding the scissors, Rep. Mike Coffman, a Republican from Colorado, had harsh words for the VA.
"While this hospital is a testament to this nation's obligations to our veterans, it also represents the largest construction failure in the history of [VA], with endless delays and cost overruns," Coffman said. A Marine combat veteran whose father served in the old Army medical center on the same site, Coffman represents Colorado's 6th District, which includes the new medical center. After redistricting placed the new medical center in his district in 2013, he sought and assumed chairmanship of the House Veterans Affairs Committee’s Subcommittee on Oversight and Investigations to help oversee its construction. A progressive group has found fault with Coffman's leadership on oversight, saying he did not act quickly enough. But Coffman places the blame squarely on the VA.
"They lied about the cost," he said. "They lied [about] the statements that it could be built for around $600 million when they clearly knew that was not the case." He asserts he pushed for the U.S. Army Corps of Engineers' eventual takeover of the project. "The VA has no business doing this," Coffman said in an interview. "They clearly are not a construction management entity. That's not their core competency. They demonstrated that here." In 2015, Congress passed legislation championed by Coffman, now law, to prevent the VA from managing another construction project of that size and cost. The VA must now transfer authority over the construction of projects costing more than $100 million to an "appropriate non-Department federal entity" such as the Army Corps of Engineers. Veteran David Ortiz thinks it's time to turn the page. "Was there some mismanagement? Yes," he said. "But we're here now, and this is the facility that we need and that we deserve, so we're going make the most of it and we'll see where we go from here."